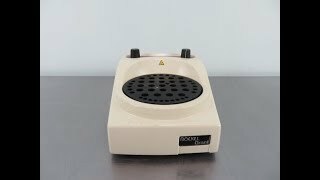 The Boekel Grant Analog Dry Bath Incubator provides consistent heating for samples in microcentrifuge tubes. The circular block of this dry heat bath will hold up to 49 samples in 0.2, 0.5, and 1.5/2.0 ml tubes. The temperature range of the dry bath heats 5° above ambient to 100°C, heating rapidly, from 25 to 100°C in 11 minutes. Temperatures can be set from the analog knobs in the back of the instrument with coarse and fine temperature adjustment. The low-profile design and compact footprint means you can keep it handy without sacrificing a lot of valuable bench space. The Boekel Grant Analog Dry Bath Incubator is an ideal choice for applications involving denaturing DNA, restricting enzyme digest, and incubating cultures. This Boekel Grant Analog Dry Bath Incubator has been fully inspected and reached it's temperature without issue. All of our lab equipment comes backed with our standard warranty. Should you have any questions, please don't hesitate to contact us.